Brandon Landry from the West Coast-based Matternet demonstrated their drones. 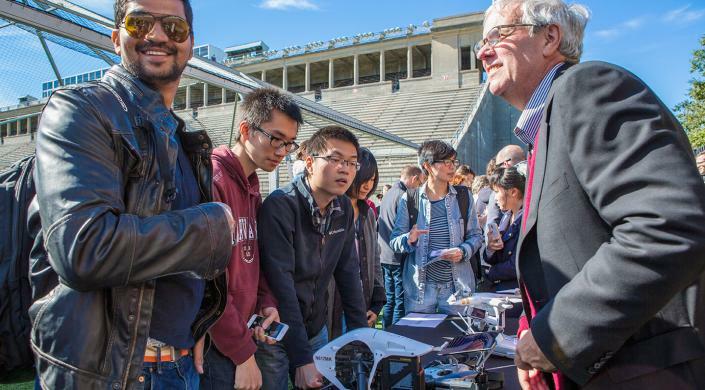 Michael Kolowich ’74, M.B.A. ’80, co-founder of Boston-based DigiNovations demonstrated the company’s video drones. 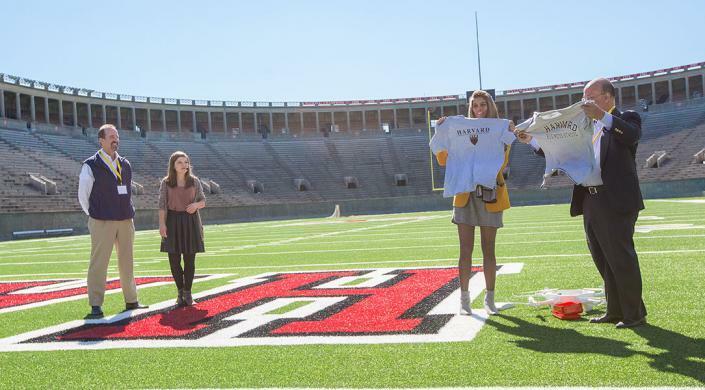 A drone from the West Coast-based Matternet delivered a T-shirt across the field to the event’s mistress of ceremonies, Sally French, and Harvard Business School Dean Nitin Nohria. Drone events are typically held in tents. “So we flipped that around; we put the people in the tent to let the drones show off their technology,” said Logan Campbell. 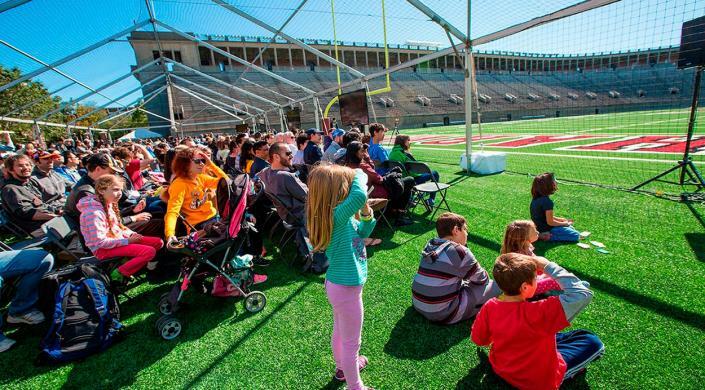 With the whine of furious bees, two drones raced three times around Harvard Stadium, rolling and tumbling before a crowd of about 500, then swooping through a goalpost and landing on the artificial turf. But that wasn’t the coolest part. The demonstration culminated “Making Robotics Fly,” an Oct. 10 event that showcased applications for drones and drone technology. 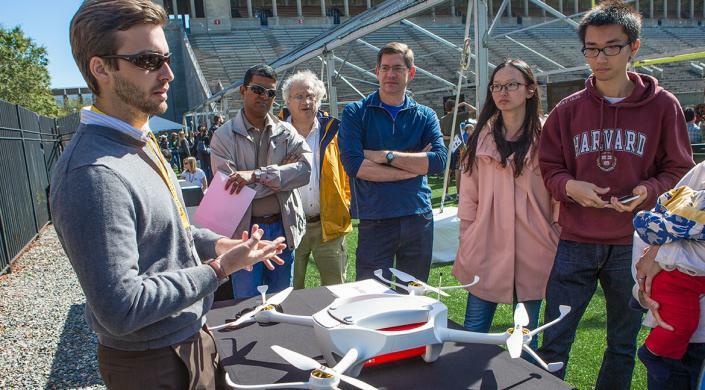 On hand were representations from half a dozen drone-related companies, plus robotics engineers from Massachusetts Institute of Technology and students, children, and others fascinated by the potential of unmanned aerial vehicles. The event was staged as part of HUBweek, a collaboration among Harvard University, MIT, The Boston Globe, and Massachusetts General Hospital designed to showcase innovations and ideas in this region’s scientific, artistic, and technology communities. Saturday afternoon’s drone session was organized by Harvard Business School(HBS), the Harvard John A. Paulson School of Engineering and Applied Sciences, and the investment firm XFund. Their sponsorship underscored the primary goal of the event: to bring together engineers and entrepreneurs and see what the two perspectives could produce in the emerging field of drones. During the event, a drone from the West Coast-based Matternet delivered a T-shirt across the field to the event’s mistress of ceremonies, Sally French. French, the social media editor of the Wall Street Journal digital network who dubs herself “Drone Girl,” spoke of the power when engineers and entrepreneurs — “nerds and used car salesmen,” as she put it — get together. 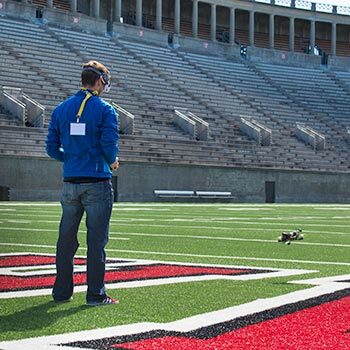 In another demonstration, Harvard alumnus Michael Kolowich, co-founder of the Boston-based DigiNovations, showed off one of the company’s video drones and even staged a crowd “selfie” via drone. The presenters, however, mostly focused on the practical uses for drones, not just their “cool” features. Matternet, for example, has been testing drone delivery in Switzerland, and company representatives spoke of creating systems to deliver medicine to remote Third World communities without transportation infrastructure. Drones have been used to find lost hikers, to monitor crops, and even to collect whale DNA, French said. It can also be entertaining. Drone Racing League CEO and founder Nick Horbaczewski ’03, M.B.A. ’08, predicts drone racing will become as popular as Formula 1 auto racing. Horbaczewski’s mere suggestion of a future drone race between Harvard and MIT was enough to send a thrilled buzz through the crowd. Drone Racing League CEO and founder Nick Horbaczewski ’03, M.B.A. ’08, predicts drone racing will become as popular as Formula 1 auto racing.